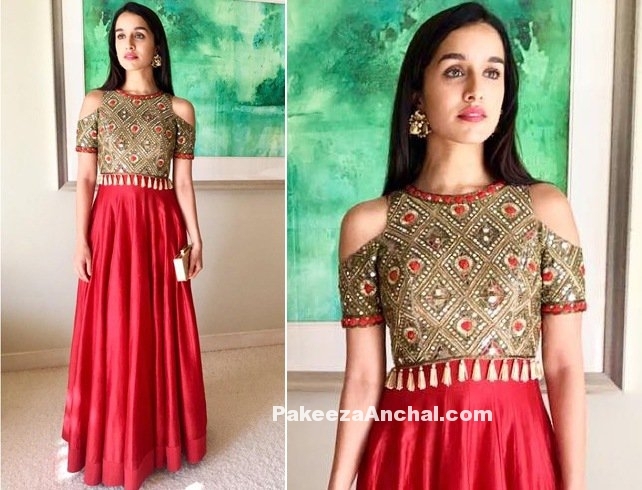 Shraddha Kapoor was seen recently in Dubai for her sisters wedding wearing a designer cut-out jacket showing her bare shoulders along with a red Chanderi Kurta designed by Arpita Mehta. Shraddha looks stunning in this outfit and completed her looks with a Michael Kors Golden clutch and Amrapali earrings. Shilpa Shetty wearing a Black Tank top with gold jacket and paired it with a gold beaded flared pants like Gharara designed by Arpita Mehta on the sets of Dance Dance. She also wore Gold dangler earrings by Isharya with curly hairstyle and a pair of Gold jootis. Mira Rajput wearing a Golden Colored Transparent Half Saree and a Sleeveless Backless Designer Blouse with a knot at back. Mira Rajput and Shahid Kapoor attended Masaba Gupta’s Wedding reception. Golden half Saree worn by Mira Rajput was designed by Arpita Mehta, while Shahid Kapoor was wearing a Jodhpuri Black Suit. Long Legged beauty Shilpa Shetty in Designer wear Transparent Saree by Arpita Mehta. Shilpa Shetty wearing a shaded Saree double color (Cream and Purple) embellished with mirror work border. Paired with a sleeveless Blouse with embroidery make this outfit look awesome on Shilpa. With Open hairstyle just falling on her shoulders makes her look gorgeous in this Double shaded Saree. Madhuri Dixit wearing a Patterned mix of Blue shades printed Saree. 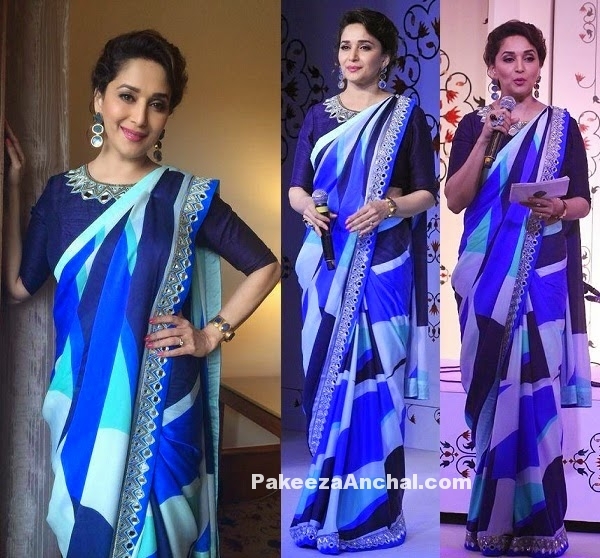 Madhuri Dixit Nene in Weightless Blue Print Multi Embroidered Saree at Tajmahal Tea Event by Arpita Mehta. NavyBlue Designer Blouse with Half Sleeves and Patch work design throughout the Blouse Neckline and Silver embellished Mirror work Designs through out the Saree border. Sonam Kapoor wearing a traditional peach orange colored mirror-work lehenga during the music launch of her upcoming movie ‘Dolly Ki Doli’. Sonam’s Lehenga Choli was designed by Arpita Mehta and She completed her look with simple jewellery and wavy hair.